Young Simon Helder is a student of the works of Frankenstein. His experiments in the creation of life are discovered by the police and he is arrested, charged with witchcraft, found guilty but insane and committed to a lunatic asylum. There, he immediately recognises the medical director as Frankenstein, who is working there under an assumed name. 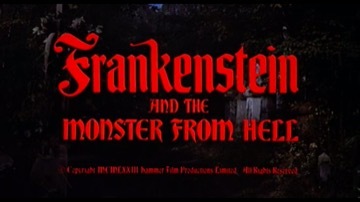 At first, Frankenstein takes Simon on to help tend the other inmates, but it is not long before the two men are working together to create another human being…..
Terence Fisher had be coaxed out of retirement to direct this, Hammer’s last Frankenstein opus and his own last stint as director. Afterwards, he retired for good and died in 1980.The screenplay for this film was the last contribution made to Hammer by Anthony Hinds, under his pen-name John Elder. Actor Bernard Lee played 007’s boss ‘M’ in all of the James Bond films up to and including “Moonraker” (1979).